We have studied how the dyadic principle of Knowledge and Will unrolls from the undifferentiated mode of Reality to the differentiated mode in the actual manifestation through the triple status of the Supermind. In the same way, the dyadic principle of Space and Time unrolls from a Spaceless and Timeless mode of Reality to a differentiated matrix of Space and Time that holds the manifestation as a temporal and perishable Reality. The Reality of the manifestation is explicit in forms that occupy a varying array of spaces but forms perish even though they may be eternally renewed and spaces contract and expand to produce variable and pulsating energy-matrices. Time appears to be de-linked from Space in the manifestation. The integrality of Space and Time in an unitary matrix of Consciousness may be hypothesized but cannot be experienced by the ordinary cognition. This is the reason why Yudhistira in the Mahabharata when asked what the greatest paradox in life was had answered that though the human being was destined to perish, one always behaved as one would eternally live. Nevertheless, Yudhistira’s cryptic comment not only shows the limitations of the divided mind, it also intuitively strikes a chord. Hidden in the depths of even a divided mind lurks an intuition that an eternal consciousness is a Reality that can be experienced and lived. However this intuition can remain a chimera unless the intermediary principle that mediates between the undifferentiated mode of Reality and the actual manifestation is discovered and worked upon. 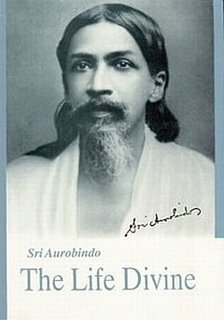 Sri Aurobindo’s gift to the realm of intellect has been the discovery of that intermediary principle which he termed as the Supermind. His gift to the world of spirituality has been the technique of making that Supermind principle operative in the earth-nature. His gift to the human being has been to chart the guide-map for a transformative evolution that can lead the human species to a new species where the Supermind principle actually replaces the mind-principle. While the undifferentiated Reality that is unmanifest is naturally non-spatial and non-temporal, the intermediate principle of the Supermind between the undifferentiated reality and the actual manifestation holds in its unitary matrix the integrality of Space and Time. Once Space and Time begins to unroll from the integral poise of unity, they begin to de-link from each other, a phenomenon that becomes complete at the level of the manifestation. Accordingly, there is a wide distribution of Time and Space in varying poises at different planes of consciousness which makes interesting study. The human mind finds it difficult to understand how a timeless and spaceless Reality can resolve into time and space as we ordinarily conceive. Sri Aurobindo describes that this difficulty arises due to the three dimensional ideas of the human mind which ignores the fact that there are many other dimensions too (CWSA 28, PG 402). ‘There are again different orders of Time and Space; that too depends on the consciousness. The Eternal is extended in Time and Space, but he is also beyond all time and Space…The Spaceless Eternal is not one indivisible infinity of Space, there is in it no near or far, no here or there – the Timeless Eternal is not measurable by years or hours or aeons, the experience of it has been described as the eternal moment. But for the mind this state cannot be described except by negatives, -- one has to go beyond and realize it (Ibid, 403).